As soon as you land at Narita Airport, you can exchange your Japan Rail Pass vouchers for the actual Japan Rail Passes at any of the JR Ticket Offices at the airport. With your JR Passes, you can get seat reservations on the Narita Express, which is the fastest and most convenient way to get to Tokyo from the airport. The one-way ride takes about an hour. The Ghibli Museum is a must-visit for Studio Ghibli fans. However, tickets to the museum are not sold at the museum. You need to purchase them well in advance, around one to four months before your desired date of visit, either from an authorised JTB Group agency in your origin country or at a Lawson convenience store in Japan. More information on tickets can be found on Ghibli Museum’s official website (http://www.ghibli-museum.jp/en/ticket-information/). Located in Mitaka, the Ghibli Museum features exhibits of the animation studio’s well-loved films, including Spirited Away, My Neighbor Totoro, Ponyo, Grave of the Fireflies, Castle in the Sky, and Princess Mononoke. It also has a life-sized replica of the Castle in the Sky robot on the rooftop garden, a gift shop, a kids play area with a mini Catbus, and a café. Take the JR Chuo Line to either Mitaka Station or Kichijoki Station, and then walk about 20 minutes through Inokashira Park to the museum entrance. You may also take the shuttle bus from Mitaka Station to the museum (roundtrip ticket costs 320 yen, one-way is 210 yen, children 12 years and below are half price). A trip to Japan with your children would not be complete without a visit to the Tokyo Disney Resort, which is made up of two Disney parks – Disneyland and DisneySea. Because DisneySea is unique to Japan, you might want to make visiting it a priority. It consists of seven themed areas – Arabian Coast, American Waterfront, Lost River Delta, Mermaid Lagoon, Mysterious Island, Mediterranean Harbor, and Port Discovery. With so many rides and attractions to check out, you and your family can easily spend an entire day there. Tokyo Disneyland also has seven themed areas – World Bazaar, Tomorrowland, Toontown, Fantasyland, Critter Country, Westernland, and Adventureland – and if everyone really wants to do both parks on the same day, it’s possible to squeeze in a few hours at night. Visit the official Tokyo Disney Resort website for information on tickets, hours, and more (http://www.tokyodisneyresort.jp/en/tdl/). From Tokyo Station, Tokyo Disney Resort is a few minutes’ walk from JR Maihama Station along the JR Keiyo Line. At Maihama Station, there is a Tokyo Disneyland Station nearby that serves the Disney Resort Monorail. Osaka is about three hours by train from Tokyo. From Tokyo Station, take a Shinkansen to Shin-Osaka Station and then transfer to the JR Kyoto Line to Osaka Station. 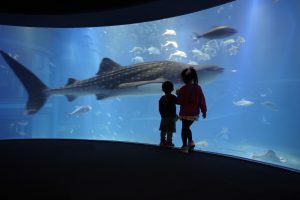 In Osaka, you can find one of the most amazing aquariums in the country – the Osaka Aquarium Kaiyukan. It is home to 15 large tanks inhabited by a wide variety of marine life, including a whale shark, octopi, penguins, seals, rays, turtles and dolphins. Take the Subway Chuo Line to Osakako Station (not covered by the JR Pass). On your second day of sightseeing in Osaka, spend a fun and enjoyable time with the family at Universal Studios. Universal Studios Japan is the second most visited theme park in the country (after Disney Resort). It is divided into eight themed sections – Amity Village, Jurassic Park, Hollywood, New York, San Francisco, The Wizarding World of Harry Potter, Waterworld, and Universal Wonderland – with rides and attractions based on worldwide box office hits such as Jurassic Park, Terminator 2, Spiderman, and Back to the Future. More information on the park and how to purchase tickets is available on their official website (https://www.usj.co.jp/e/). Take either the JR Osaka Loop Line or the JR Yumesaki Line to Universal City Station. 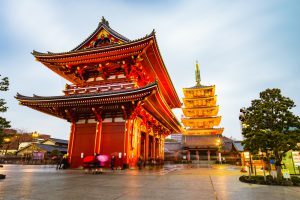 There are many historical and cultural sites in Japan that are kid-friendly, particularly the ancient city of Nara, which became Japan’s first permanent capital in the early 8th century. In Nara, you and your children can see Todaiji Temple’s Daibutsuden, the largest wooden building in the world, housing a 15-metre tall, bronze Buddha statue. 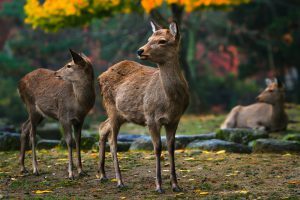 You can relax at spacious Nara Park, where hundreds of deer roam freely, trying to get visitors to feed them or play with them. Moreover, you can also explore beautiful traditional Japanese gardens, such as the Yoshikien Garden and the Isuien Garden, and learn about the Edo Period merchant life at the Naramachi District. From Osaka Station, take the JR Yamatoji Line to Nara Station. Nara Park, Todaiji Temple and the others are just a 20-minute walk away. From Osaka, travel to Narita Airport takes about four and a half to five hours. Take the JR Kyoto Line to Shin-Osaka Station, where you need to catch a Shinkansen to Shinagawa Station. Once at Shinagawa Station, look for a JR Ticket Office to secure seat reservations on the next Narita Express headed to Narita Airport. The entire journey is covered by your JR Pass.